In 1825, I left Philadelphia for a journey through Pennsylvania. I spoke first at Weston; we had an elder on West Chester Circuit, named Jacob Richardson. We had buried a young Christian before preaching the sermon, and gave me the sacrament sermon in the afternoon. I spoke from Matt. 26 chap. 26-27 ver. I felt as solemn as death; much weeping in the Church, tears stole down the faces of the people. Jacob Richardson was a spiritual preacher. God attended the word with power, and blessed his labors much on his circuit. From there a friend carried me to Downingtown, where I took stage and went on to Lancaster; but prospect not so good there; they had a new Church but not paid for; the proprietor took the key in possession and deprived them of worshipping God in it. But I spoke in a dwelling house, and I felt a great zeal for the cause of God to soften that man's heart, or kill him out of the way one had better die than many. Brother Israel Williams, a few days, called to converse with him on the subject, and he gave him the key; he was then on his death-bed, and died in a short time afterwards, and we must leave him in the hands of God, for he can open and no man can shut. I went on to Columbia and spoke in the Church, and my tongue fails to describe the encouragement I met with. The Lord converted poor mourners, convicted sinners, and strengthened believers in the most holy faith. God's name be glorified for the display of his; saving power. I led class, held prayer meetings, and left with a good conscience for little York. The first sermon I preached was in the Church at 10 o'clock in the morning, from Mat. xxvi, 26, 27, to a large congregation. My faith it seemed almost failed me, for when I got in the stand, so hard was the task that I trembled, and my heart beat heavy, but in giving out the hymn I felt strength of mind, and before I got through, I felt so much of life and liberty in the word, I could but wonder, and in the doctrine of Christ it was a sacramental sermon indeed to my soul. I spent some weeks there, and we enjoyed good meetings and powerful outpourings of the Spirit. I truly met with both good and bad; my scenes were many and my feelings various. I bless the Lord that the prayers of the righteous availeth much. After freeing my mind, I passed on to York Haven, and preached in a School-house to a white congregation. I was not left alone, but was treated very well by a white Methodist lady. I took lodgings at her house all night; next afternoon took stage for Harrisburg, and when I stopped at the Hotel a gentleman introduced me to the Steward, who took charge of me and escorted me to Mr. Williams, where I took supper. It was on a New Year's evening; the colored congregation had expected me and made a fire in our Church, but being late when I arrived, they had gone to hear a sermon in a white Methodist Church, and I had retired to rest a while in the evening. When they returned they came after me, taking no excuse, and I had to come down stairs, go to the Church, and preach a sermon for them, then 10 o'clock at night. The effects of the gospel of Christ was no less than at other great seasons, but was wonderful - backsliders reclaimed and sinners converted - there was mourning, weeping, shouting and praising of God for what he had done. I preached several sermons, and was well treated by all circles of people. We had large congregations of well-behaved people; and feeling my work done in this part, I proceeded to Carlisle, Pa. There was a small body of members; I spoke and led class for them during the time I was there, which was ten days; felt my discharge of God, and took stage to Shippensburg. There was great success at this places; fifteen joined the Church; some of the most hardened sinners became serious and reformed. I was astonished at the wonderful operations of the Spirit, and the immense congregations. At the first sermon the house was crowded, and I had the good attention of the people. A man came into the house intoxicated, and offered to interrupt by speaking, but a gentleman put him out so quietly that it had no effect upon the meeting. When I contemplate the goodness of God to the human family, in putting them in a proper capacity of choosing the way of salvation, I feel sometimes almost lost, to think that God has called such a worm as I to spread the common Saviour's name. But said the Lord, "I will send by whom I will" - praise the Lord who willeth not the death of sinners - "as I live, saith the Lord, I have no pleasure in the death of the wicked, but that they turn and live." I then proceeded on to Chambersburg by stage, and met with one Rev. Winton, who displayed much of a christian disposition, and conversed freely with me on the most particular points of the God-Head, for my instruction, showing his benevolence. He knew I was a stranger - he had friends to go to at that place, but he offered to pay my bill for a room at the Inn. I never have forgot the goodness of that gentleman, who, I believe, to be a great gospel minister. I stopt at brother Snowden's, who were very kind to me. The Lord continued to pour out His Spirit and clear the way for me, and also continued to convict, convert, and reclaim the backsliders in heart. There were very large congregations, both in and out of doors, and great revivals throughout the circuit. The elders generally treated me well, for which may the Lord bless them and their labors in his vineyard, and add to the Church such as shall be forever saved from the power of sin - may I take heed lest I fall, while I teach others. Saith the Apostle: "Paul may plant and Apollos water, but God must give the increase," for which I feel thankful. I remained in this place for some weeks, but being debilitated in body, I left for Philadelphia about the middle of April. On my return, I met with such a severe trial of opposition, that I thought I never would preach again, but the Apostle says, "ye are not your own but are bought with a price." I feel glad that God is able to keep all that put their trust in him, though the mis-steps of others often interrupt our own way - I always found friends on different parts of Globe. I preached and led classes on my return. Praise God for his delivering grace - "Oh the depth of the riches" of the glory of God, how unsearchable are his ways; they are past finding out - a sea without bottom or shore. One thing is encouraging, "When he who is my life shall appear, I shall be like him." "I know my Redeemer liveth, and shall stand on the latter day upon the earth, and though worms destroy this body, yet in my flesh shall I see God." Lord help me to keep this confidence. Rev. Richard Williams, a gentle and christian-minded man, treated me well. God would not suffer me to be destroyed. It is not by might or by power, but by the Spirit, saith the Lord of hosts. On my return I stopped at Lancaster; the Church was opened, and I preached to large congregations, and with powerful success; the dead were brought to life by the preaching of the cross of Christ. From there I left for Philadelphia. In July, 1824, I felt an exercise of mind to take a journey to Reading, Pa., to speak to the fallen sons and daughters of Adam. I left the city and stopped at Norristown on my way to Reading. I spoke in the Academy to a respectable congregation, the same evening I arrived there. I felt a degree of liberty in speaking, though it was a quiet meeting, and I also felt thankful that the Lord would manifest himself through such a worm as me. Next morning I walked four miles and stopped at Littleton Morris's, and preached two sermons on the Sabbath day, and God struck a woman, and she had liked to have fallen to the floor; I spoke in the Dunkard's meeting house. This ended my visit with them at this time. On Tuesday I walked three miles to Schuylkill, to take the Canal boat on Wednesday morning. I met in company with a Presbyterian minister and lady on the boat; they treated me very kindly indeed. We arrived in Reading about 7 o'clock in the evening. I was recommended to a family in that place, the man of which had once confessed religion, but had fallen from grace, and they were very kind to me. The next morning I enquired for other respectable families of color, and an elderly lady of color that belonged to the white connexion, and the only colored Methodist in the place at that time, conveyed me to Mrs. Murray's, where I remainded a while; then the elderly lady, just mentioned, feeling interested for me, went to the proprietors of the Court-house with me, to see if we could get in to preach in, and like Esther the Queen, who fasted and prayed, and commanded the men of Jerusalem and the women of Zion to pray; as she approached the king the sceptre was bowed to her, and her request was answered to the saving of Mordica, and all the Jewish nation. When we approached this gentleman, who was the head Trustee of the Protestant Church, I showed him my recommendation, and he answered me, "Madam, you can have it," and I felt humble to God for the answer. I felt it my duty to preach to the citizens, and accordingly made an appointment for Sunday afternoon at 4 o'clock. Rev. 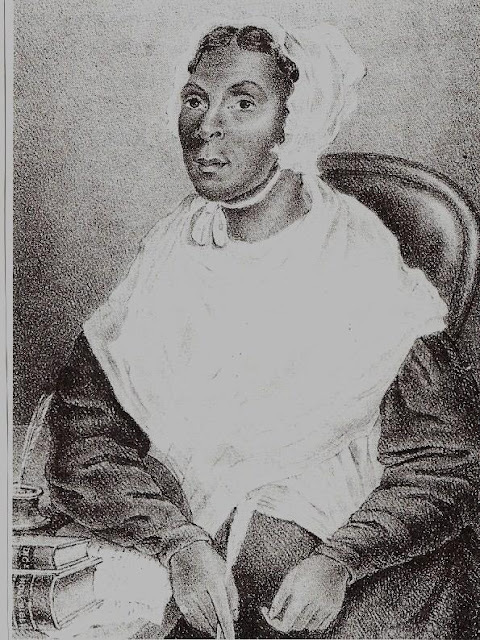 James Ward, a colored Presbyterian, assembled with us, although he was so prejudiced he would not let me in his pulpit to speak; but the Lord made a way where there was no way to be seen; there was no person to intercede until this sister tried to open the way; the men of color, with no spirit of christianity, remained idle in the enterprise, but we got possession and we had a large concourse of people. I spoke with the ability God gave me. I met with a family of color, but very respectable, that formerly had belonged to our Church in Baltimore; they invited me to their house, and it was a home to me, praise God. I held a meeting in their house previous to holding meetings in the Court-house; the white brethren and sisters assembled with us. We called on a minister's lady, and she treated me very kindly, while he, like a Christian, united and helped to go through with the meetings. I visited the Quaker friends (amounting to four only) then in the place, and very pleasant visits they were. A great number of Christian friends called on me, among the rest this minister's lady, who left a donation in my hand, consequently the way was made where there was no way, but I left in friendship. Praise God I feel the approbation now. It is to be lamented, that James Ward, colored, with his over-ruling prejudice, which he manifested by saying no women should stand in his pulpit, and with all the advantages of a liberal education, was in a few weeks after I left there, turned out of; the Church. On returning to Philadelphia, I stopped at Pottsgrove and found a Society of colored persons, christians I believe. We had solemn meetings there; I met kind friends there, and visited a Church about six miles off; preached in the morning; the Lord was with us; of this truth my soul is a witness; in the afternoon I preached to a large congregation. Next morning I left for Philadelphia. I continued to preach, paid some short visits about, and was welcomed home again.